You can't go wrong with chocolate chip cookies, can you? HECK NO! They're delicious, make the house smell awesome, and no matter what you were doing, what troubled you during the day, who you wanted to punch in the face, etc, etc - they always make you feel good. Even if you've had 5 in a row! That last one might just be me, don't judge. Some of you (all 3 who read this, including my Mom (Hi MOM!) might remember the vegan dark chocolate coconut cookies that I made a bit ago. 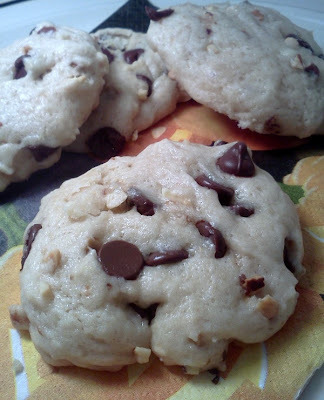 This cookie is using the same recipe, just adjusted to whatever I like OR have in my pantry at the moment. It's my go to recipe, so easy to twist into whatever you're craving at the moment. I've used it to make the two cookies mentioned here plus red velvet chocolate chip cookies, funfetti cookies, AND pumpkin cookies. See, this recipe is something you need to keep on hand and experiment with! Preheat oven to 350 degrees. Line a baking sheet with parchment paper and set aside. In a large bowl whisk together flour, b.p, salt, chocolate chips, and pecans - set aside. In another bowl toss in the sugar. Pour the oil, milk, and extract on top of it and whisk until all smooth. Add the wet mixture to the dry, I would switch to a wooden spoon or rubber spatula as the dough gets thick and might f up your whisk. 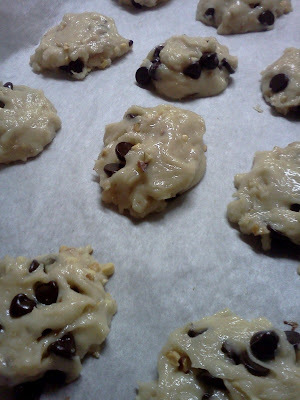 Drop by spoonfuls onto baking sheet, no need to space them too far apart, they don't spread that much.